Common Football Injuries: Groin and Hamstring StrainsGoing into Euro 2016, The Guardian newspaper described Coach Roy Hodgson’s England team as a “slick outfit”. In order to maintain that positive assessment, the onus is on the players to guard against injuries, both on and off the field. When a game is underway, a plethora of injury types can afflict footballers. The fact that football calls for super-quick movements and sudden changes in direction heightens the risk of injuries. 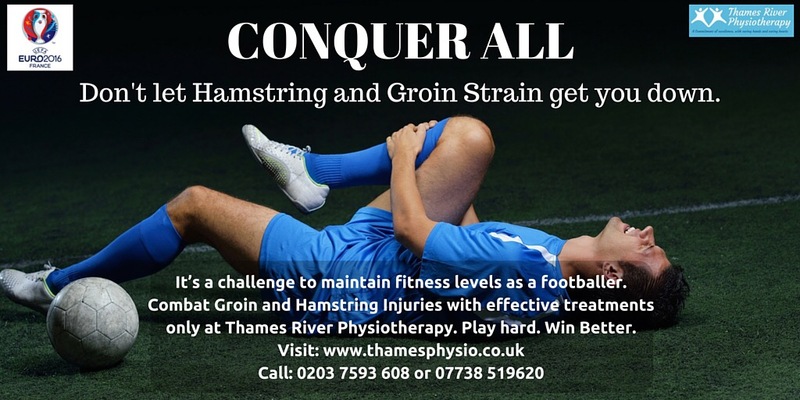 It has been estimated that 10-18% of all football injuries involve groin injuries. Our bodies have five adductor muscles, namely: adductor brevis, longus, magnus, pectineus and gracilis. Groin strains are defined as muscular tears, or ruptures to one of these muscles. The adductor longus is the one that’s most often strained. It usually occurs when a player stretches, to kick the ball, for example. In doing so, the adductor muscles in the inner thigh are extended more than normal. Apart from generating pain during movement, mild cases do not manifest as strain. The more serious cases are excruciating; and hinder basic activities such as walking or jogging due to loss of leg strength. We have four Hamstring muscles: semimembranosus and semitendinosus (medially) and biceps femoris – short and long heads (laterally). A tear in these is known as a hamstring strain that ranges in severity from mild to high. Some of the more common reasons for the occurrence of hamstring injuries include: Poor timing-intermuscular coordination and eccentric strength in the hamstring muscles; poor running mechanics; improper warm-up; inappropriate training loads and lower back pathology. • Reducing hamstring pain and inflammation. • Normalising muscle range of motion and extensibility. • Strengthening knee muscles and hamstrings, lower limb muscles: calves, hip and pelvis muscles. • Improving game speed, proprioception, agility and balance.